Put the words “French Onion” in front of just about any recipe, and I’m pretty much guaranteed to like it. This French Onion Chicken? True amore. Hunks of crusty sourdough bread, sweet onions, and juicy chicken tossed in melted butter then baked until caramelized and tender, this tasty recipe transforms the flavors and ingredients of French onion soup into an easy weeknight one pan dinner. Whole roast chicken isn’t something I make often, but when I saw a recipe for a French-onion-inspired roast chicken in a recent issue of Cooking Light, I couldn’t put it out of my head. I cooked other things in the meantime, but it kept coming back to me. The true reason I avoided the recipe was that it seemed overly fussy. It called for caramelizing the onions and fixing a sauce on one pan, scraping it onto a second pan to bake, and butterflying a chicken, which, no matter how many times I watch Ina do it on TV, is not something that I relish the idea of tackling. Worst of all, it did not include the best part of any French onion anything: the crusty bread. Still, the idea stuck. Surely I could come up with an easy French onion chicken, I assured myself, one that would be equally scrumptious but require less effort. My Big Idea was to see if I could convince the onions to caramelize on a sheet pan in the oven, then use that same pan to bake the chicken so that I’d only dirty one dish. It worked even better than I imagined! In the oven, the onion breaks down, sweetens, and turns into a glorious caramelized sauce ideal for spooning right over the chicken and bread. The trick is to crowd the pan. 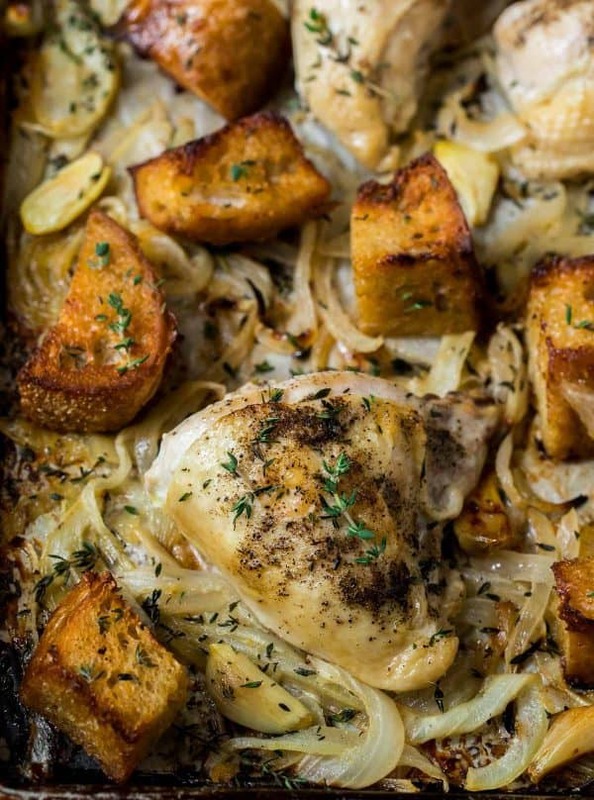 Normally crowding a pan of roasted veggies is their demise, but in the case of this French onion chicken bake, it works in our favor by ensuring the onions’ sweet juices don’t escape. The hunks of bread were an easy and (I dare say) necessary addition. The roughly cut bread pieces transform into big, golden, lightly crispy “croutons,” just like the floating pieces of French bread in my Instant Pot French Onion Soup do. Even better, as the chicken bakes, the bread absorbs some of its juices, giving the golden cubes even more flavor. While we *could* stop at the chicken, onions, and bread and have a delicious recipe, a few final touches make this French Onion chicken even more memorable: bit of Dijon mustard (so French! ), whole cloves of roasted garlic, and a sprinkle of fresh thyme. Oven Roasted Brussels Sprouts (these can cook in the oven right along with the chicken; you may need to add a few minutes to the baking time for each). A big green salad like Anytime Arugula Salad or Shaved Brussels Sprouts Salad. Simply sautéed veggies like this easy Sautéed Zucchini. Easy French Onion Chicken. 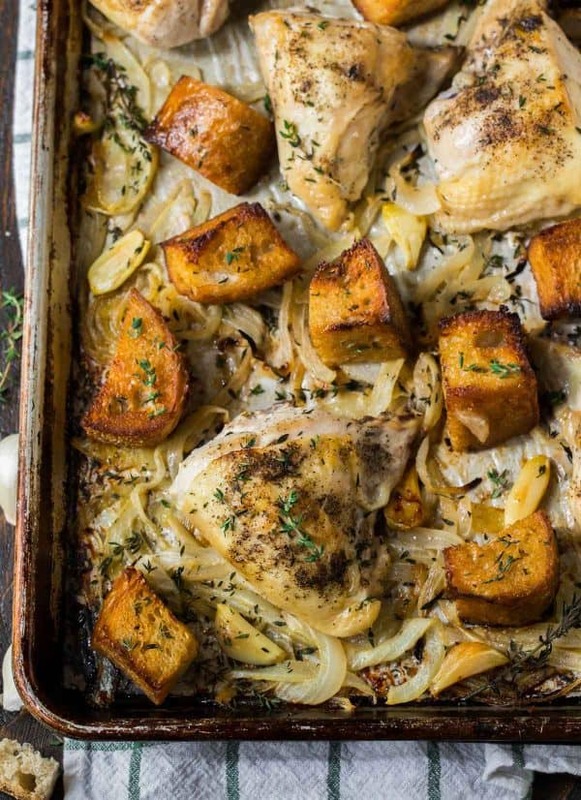 A healthy chicken dinner with crispy bread, caramelized onions, and juicy chicken breasts or thighs, baked on a single sheet pan! Place a rack in the center of the oven and preheat the oven to 400 degrees F. For easy cleanup, line a large, rimmed baking sheet with aluminum foil, parchment paper, or a silicone baking mat. Place the onions, bread cubes, and garlic cloves in a large bowl. In a small heatproof bowl or liquid measuring cup, melt the butter. Whisk the olive oil, mustard, and 1/2 teaspoon kosher salt in with the butter, then pour over the onion-bread mixture. Toss to coat as evenly as possible. Turn the mixture out onto the prepared baking sheet. Spread into an even layer. Nestle the chicken pieces into the onion mixture. It can overlap the onions a little, but make sure it does not cover the bread. Sprinkle the chicken with the remaining 1 teaspoon salt and pepper. Bake for 15 minutes, then remove the pan from the oven and carefully turn the bread cubes. Return to the oven and bake until the bread is deeply golden and the chicken registers 160 degrees F on an instant-read thermometer inserted at the thickest part, about 15 additional minutes for smaller pieces and 20 to 25 minutes for larger pieces. If some chicken pieces cook more quickly than others, remove the cooked pieces to a plate and cover to keep them warm, then return the pan to the oven and continue baking until all of the chicken is cooked through. If you'd like the bread to be even more crisp, you can transfer all the chicken pieces to a plate (cover the plate with foil to keep the chicken warm), then turn the bread once more and return the pan to the oven for 5 to 7 additional minutes, or until the bread reaches your desired crispness. Return the chicken to the pan and sprinkle the whole shebang with fresh thyme. Transfer the chicken to plates. Serve hot with the croutons and a spoonful of the roasted onions and garlic over the top. Do you think this could work in a slow cooker? Hi Emma, unfortunately, I don’t think this recipe would turn out as well in a slow cooker. 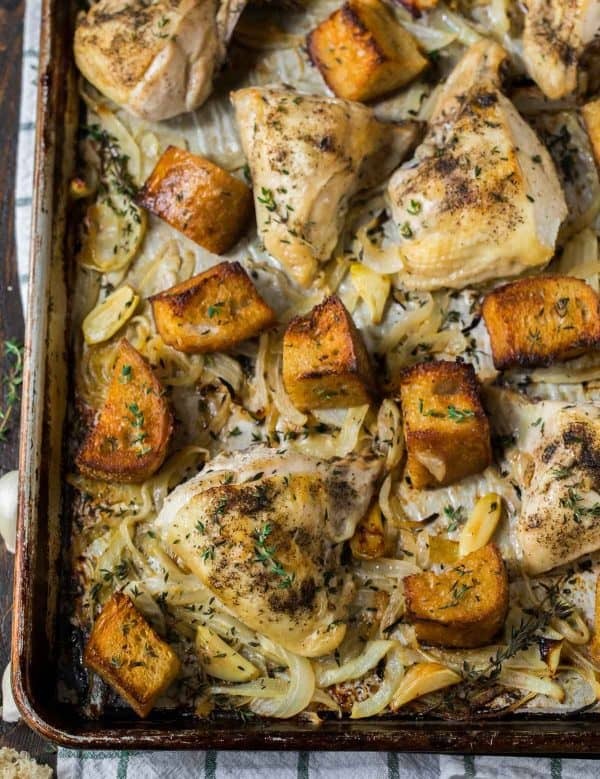 The sheet pan in the oven is necessary for caramelizing the onions, ensuring that the chicken skin doesn’t stay soft, and browning and crisping the croutons. I hope you love the recipe if you decide to give it a try! This sounds delicious. Do you think it would work with skinless chicken breasts, perhaps by increasing butter and olive oil? Hi Bonnie, I’d be concerned about the meat drying out (and if it’s boneless and skinless, it will probably dry out). I’d suggest still cooking bone in/skin on, then removing the skin prior to serving if you prefer not to eat it. I hope that helps! Hi Erin, it looks great! I wonder if I could use a mix of bone-in, skin-on chicken legs and breasts for this recipe. Also, do I must use sourdough bread, or other hearty bread may work too? Thanks again and reading your post is always a delight! Hi Cynthia, yes, you could use a mix, but make sure the pieces are fairly equal sizes so they cook at roughly the same rate. And yes, you can use another hearty bread of your choice! I hope you enjoy. I loved this!!! It was so easy to make. I made it last week and it was soooo good, even though I botched the recipe! I used chicken leg quarters and didn’t cut the pieces down to size. Therefore I had to cook it for a good 45 minutes, which made my croutons very crispy! I did pull a few croutons out early, and they were so yummy. I already bought the ingredients to make it again. This time I’m just going with chicken thighs and chicken drums, as I couldn’t find (organic) skinless/boneless chicken breasts in the store. Thank you Erin! Thank you for taking the time to write this wonderful review, Heather! I’m glad to hear it still came out, and I’m happy to hear you loved it! I’m not a cook. How do I do this with just chicken breasts? Hi Randi! Do you mean boneless, skinless chicken breasts? If yes, I have not tried those in this recipe but they would need less time to cook, perhaps 20-25 minutes total depending on size. Using a meat thermometer to check that they’re 165 degrees F would be helpful. Note that the chicken may come out more dry, but I hope this is helpful to you.